Recent surveys at GBC have indicated a concern with both note-taking and reading skills among both students and faculty. Join the VHC and members of the TAACCCT grant team to discuss what problems we are seeing and discuss possible techniques to address these issues in courses. We will also be highlighting some of the tools in the Humanities Toolkit which address these issues. Below are some resources in the Humanities Toolkit which faculty can use in their classes to encourage proper note-taking and reading skills. 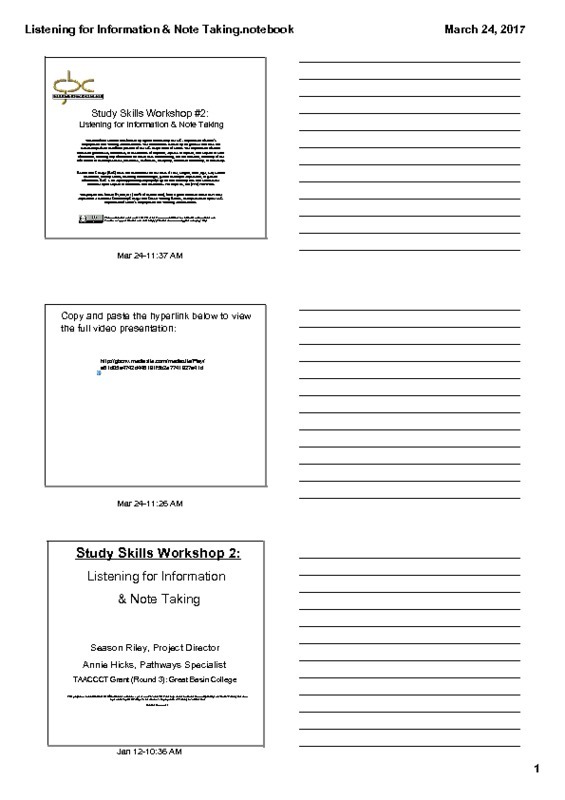 In response to a request by Great Basin College Career and Technical Education (CTE) faculty, the TAACCCT Team put together a series of workshops in Fall 2016 to discuss the importance of note-taking. This ten-minute video by Season Riley and Annie Hicks covers the importance of listening closely for information, identifying key information, and placing that information in notes. The video can be viewed through the self-containined MediaSite page (click here). An accompanying pdf of key slides from the presentation can also be downloaded (click here). This project was funded $4,009,331 (100% of its total cost), from a grant awarded under the Trade Adjustment Assistance Community College and Career Training Grants, as implemented by the U.S. Department of Labor’s Employment and Training Administration. While note-taking is a key skill for both academic and professional life, so too is reading across multiple contexts for information.. 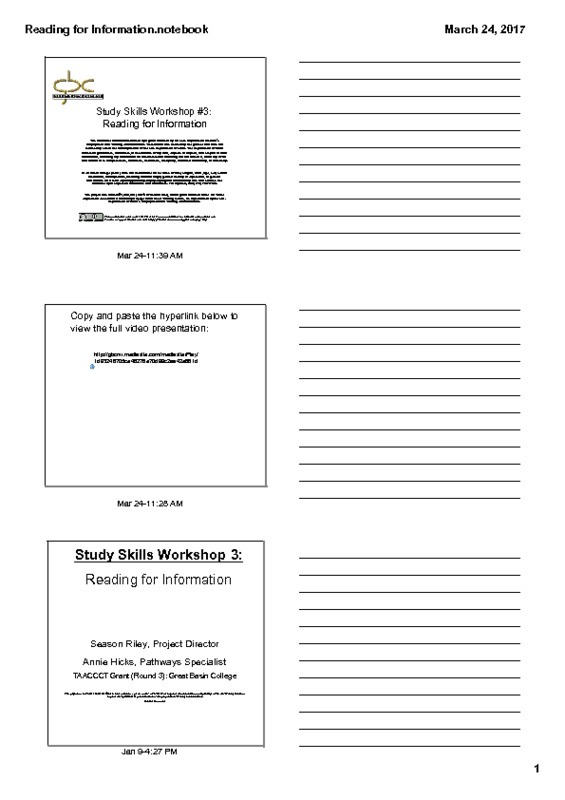 In response to a request by Great Basin College Career and Technical Education (CTE) faculty, the TAACCCT Team put together a series of workshops in Fall 2016 to discuss the importance of reading skills. This ten-minute video by Season Riley and Annie Hicks covers the importance of listening closely for information, identifying key information, and placing that information in notes. This video developed by S. Clowes covers the basics of the Cornell Note-Taking System.